By sending this booking your details will only be sent to Eighteen Sky Bar and will never be shared with other third parties. By clicking this box you agree to the Terms and Conditions set out above. 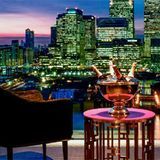 You can book to reserve an area of Eighteen Sky Bar for you and your friends. Just enter your requirements below to see what they have to offer. Do you work at Eighteen Sky Bar? What did you think of Eighteen Sky Bar?